Application of emollients is a widespread traditional newborn care practice in many low and middle-income countries (LMICs) and may have the potential to decrease infection and consequent mortality in preterm neonates. We systematically reviewed literature published up to December 2012 to identify studies describing the effectiveness of emollient therapy. We used a standardized abstraction and grading format to estimate the effect of emollient therapy by applying the standard Child Health Epidemiology Reference Group (CHERG) rules. We included seven studies and one unpublished trial in this review. Topical emollient therapy significantly reduced neonatal mortality by 27% (RR: 0.73, 95% CI: 0.56, 0.94) and hospital acquired infection by 50% (RR: 0.50, 95% CI: 0.36, 0.71). There were significant increases in weight (g) (MD: 98.04, 95% CI: 42.64, 153.45) and weight gain (g/kg/day) (MD: 1.57, 95% CI: 0.79, 2.36), whereas the impacts were non-significant for length and head circumference. Emollient therapy is associated with improved weight gain, reduced risk of infection and associated newborn mortality in preterm neonates and is a potentially promising intervention for use in low resource settings. Large scale effectiveness trials are required to further assess the impact of this intervention. Neonatal mortality is increasingly important in order to progress on the Millennium Development Goal (MDG) for child survival by 2015 and beyond, as 40% of under-five deaths occur in newborns and 14% of these are attributable to preterm birth complications . Despite the progress in reducing under five mortality, advances in addressing low birth weight (LBW) and prematurity have been slow. Every year around 15 million babies are born preterm, mostly in Africa and South Asia, and over 1 million die due to complications of prematurity . The mortality rate among preterm neonates less than 32 weeks gestational age in some developing countries is over 50% [3, 4], and more than half of these deaths are attributable to vulnerability to infections . Moreover, there has been an increase in preterm birth rates over the past 20 years . Evidence suggests that compromised skin barrier function of preterm newborns serves as an important contributor towards increased susceptibility to infections, hence morbidity and mortality. The high prevalence of malnutrition and environmental load of pathogenic organisms in developing countries further enhances this vulnerability. Newborn oil massage is an intervention that has been a traditional practice in the Indian subcontinent for hundreds of years [7–9] and this acts by augmenting the mechanical barrier and also is a source of essential fatty acids like linoleic acid . It provides a physical barrier to skin disruption, reduces microorganism invasion and consequently reduces hospital acquired infections . It also reduces transepidermal water loss [12, 13] and conserves heat and energy to promote growth . Mustard oil is the most commonly used emollient, particularly in South Asia, but other natural plant oils like sunflower, sesame, coconut, olive, and soybean oils are also commonly available and used. Animal studies have raised concern that mustard oil is much less effective at promoting and maintaining skin integrity than other emollients . More recently there have been studies suggesting the benefit of newborn massage on brain development, stress reduction and reduced risk of retinopathy of prematurity [16, 17]. Despite the wide body of primary research on emollient therapy there are few syntheses of the existing data. A Cochrane review  on this subject only covered extremely low birth weight infants from High Income Countries (HIC). Given the potential for topical emollient therapy to prevent infection in preterm or low birth weight infants in low and middle income countries (LMICs), and the risks that this traditional practice may in fact be harmful, in this review, we have estimated the effect of topical emollient therapy on hospital acquired infection, growth, mortality and other health outcomes among hospitalized preterm infants. We have reviewed the available literature and evaluated the quality of included studies according to the Child Health Epidemiology Group (CHERG) adaptation of Grading of Recommendations, Assessments, Development and Education (GRADE) criteria . We systematically reviewed literature published up to December 2012 to identify studies describing the effectiveness of emollient therapy. Following CHERG Systematic Review Guidelines , we searched PubMed, Cochrane Libraries, Embase, and WHO Regional Databases to identify all published and unpublished clinical trials. Additional studies were identified by hand searching references from included studies. Search terms included combinations of emollient* OR “emollient therapy” OR “massage” OR skin care OR oils OR “plant oils” OR “vegetable oils” OR “mineral oil” OR sunflower OR safflower OR coconut OR soybean OR sesame OR massage AND preterm* OR “low birth weight” OR neonate* OR newborn OR LBW. No language or date restrictions were applied in the searches. Studies evaluating prophylactic application of topical emollient to preterm neonates (< 37 weeks gestation) and starting within the first 96 hours after birth and continued for at least one week thereafter were included. Studies that included topical emollient versus routine skin care or one topical oil (or a combination of oils) versus another (or a combination of oils) were included. We excluded studies examining the impact of aquaphor, as these are mostly used in developed country settings, or those that were conducted in HIC. We abstracted data describing study identifiers and context, study design and limitations, intervention specifics and outcome effects into a standardized abstraction form for studies that met the final inclusion criteria as detailed in the CHERG Systematic Review Guidelines . Outcomes of interest included mortality, hospital acquired infections, skin condition, weight, length, head circumference and neuro-developmental outcomes. Each study was assessed and graded according to the CHERG adaptation of the GRADE technique . We conducted a meta-analysis for individual studies and pooled statistics were reported as the relative risk (RR) for categorical variables and mean difference (MD) for continuous variables between the experimental and control groups with 95% confidence intervals (CI). Mantel–Haenszel pooled relative risk and corresponding 95% confidence interval (CI) were reported or the DerSimonian–Laird pooled relative risk and corresponding 95% CI where there was an unexplained heterogeneity. All analyses were conducted using the software Review Manager 5.1. Heterogeneity was quantified by Chi2 and I2, which can be interpreted as the percentage of the total variation between studies that is attributable to heterogeneity rather than to chance; a low p-value (less than 0.1) or a large chi-squared statistic relative to its degree of freedom and I2 values greater than 50% were taken as substantial and high heterogeneity. In situations of high heterogeneity, causes were explored by sensitivity analysis and random effect models were used. We identified 3210 titles from searches conducted in all databases. After screening titles and abstracts, we reviewed 27 papers for the identified outcome measures of interest of which seven [11, 14, 20–24] papers were selected for inclusion, which evaluated the impact of topical emollient therapy versus no intervention or control (Figure 1). We also included data from one unpublished trial . Included studies used sunflower, coconut, soybean or mineral oil as emollients and all were conducted in developing countries. Two studies [11, 21] included neonates < 33 weeks gestation, two studies [20, 23] included neonates < 34 weeks gestation, three studies [14, 22, 25] included neonates <37 weeks gestation while one study  included neonates <35 weeks gestation. Three studies [11, 20, 21] identified gestational age according to the Dubowitz and Ballard, and on the basis of maternal dates while one study  estimated from ultrasound records and Ballard scores at admission, whereas the other studies have not reported on the method (Table 1). In Table 2, we report the quality assessment of studies by outcomes. For neonatal mortality and morbidity, findings were based on three studies; topical emollient therapy significantly reduced neonatal mortality by 27% (RR: 0.73, 95% CI: 0.56, 0.94) (Figure 2) and reduced hospital acquired infections by 50% (RR: 0.50, 95% CI: 0.36, 0.71) (Figure 3). For growth outcomes, data was pooled for four studies; emollient therapy was associated with significant increase in weight (MD: 98.04, 95% CI: 42.64, 153.45) (Figure 4) and weight gain (g/kg/day) (MD: 1.57, 95% CI: 0.79, 2.36). The impacts were non-significant for length (MD: 0.33, 95% CI: -0.15, 0.81) and head circumference (MD: 0.05, 95% CI: -0.30, 0.41). Of the outcomes assessed for effect of topical emollient therapy among preterm newborns in developing countries, we applied the CHERG rules for evidence review to these outcomes. We had data on mortality but since the evidence was weak, we used hospital acquired infection (severe morbidity) as a proxy for neonatal mortality and propose that topical emollient therapy for preterm neonates can reduce neonatal infection related mortality by 50% among preterm neonates <37 weeks gestation. 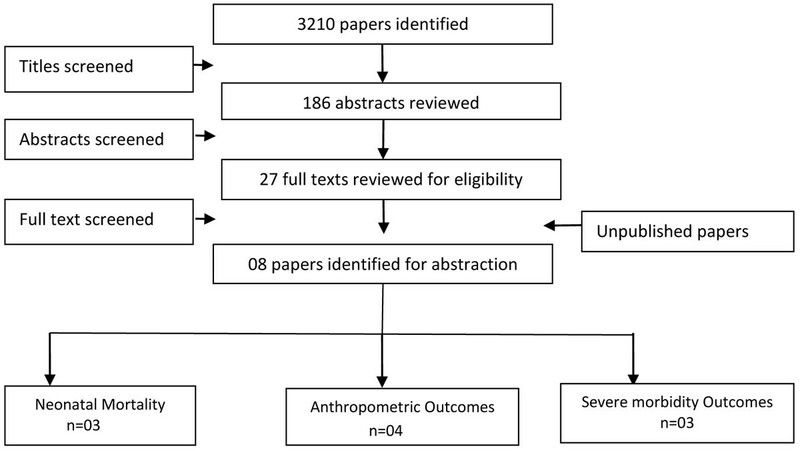 In this systematic review we estimated the effect of topical emollient therapy on preterm newborns in developing countries. Trials were included that reported various neonatal health outcomes including hospital acquired infection, mortality and anthropometric indices. The studies contributing data in this review were conducted in developing countries including India, Pakistan, Bangladesh, Egypt and Brazil, hence increasing the generalizability of the studies to newborns in LMICs with the highest neonatal mortality and infection rates. All the studies evaluated the impact of topical emollient application in facility settings among preterm neonates. Emollients used in the studies included sunflower, coconut, soybean and mineral oil. The follow-up period ranged from 28-31 days of life. Only one study reported the follow-up till discharge . Topical emollient therapy has been shown to reduce mortality and hospital acquired infections significantly and also improved weight. It was associated with a significantly higher weight gain of 98g than in controls over the first 28 days of life. However the impacts on length and head circumference were non-significant. Neurodevelopment outcomes were reported in only one study and were found to be comparable in the intervention and control group . It is worthwhile to observe that although the evidence is weak for neonatal mortality due to the fewer number of events, the evidence comes from good quality RCTs with no significant heterogeneity reported in the pooled analysis. The findings from this review contradict with the findings from a published review which indicated increased risk of hospital acquired infection with prophylactic application of topical ointment in preterm neonates . This review differs from our review as it was from studies conducted in HICs with most of the participants being extremely LBW infants and the emollient most commonly used in the trials was aquaphor ointment and most infections were due to coagulase-negative staphylococci. The findings of the previous review cannot be generalized to LMIC settings, as most infections in these settings are due to gram-negative bacteria, for which the attributable morbidity and mortality is much greater than that of coagulase-negative staphylococcal infection [26, 27]. Also the commonly used emollients in these settings include coconut, sunflower, almond and olive oil . In this review we have shown that there is potential for benefit of this traditional, simple, affordable, and effective intervention. Efforts should now be concentrated on its scale-up for delivery in hospitals in low-resource settings to reduce neonatal mortality risk due to prematurity and infections. There are no large scale community based effectiveness trials to evaluate its pragmatic benefits or otherwise in community settings. Studies are also required to assess if this intervention is associated with any adverse effects and to explore the benefits of various emollients and to determine which ones are most effective. Our analysis of the effect of topical emollient therapy among preterm neonates in developing countries suggests benefit in reducing hospital acquired infections and mortality and improving weight in preterm neonates. However, its implications and feasibility for community scale-up needs to be explored. Dr. ZAB was responsible for designing the review and coordinating the review. RAS and JKD were responsible for: data collection, screening the search results, screening retrieved papers against inclusion criteria, appraising quality of papers, abstracting data from papers, entering data into RevMan, analysis and interpretation of data and writing the review. JKD was responsible to apply the GRADE criteria for outcome assessment. ZAB and GD critically reviewed and modified the manuscript.